Waterfall Cake Dummy in polystyrene, choose your size. Waterfall cake in polystyrene is widely used in cake design, or the art of decorating cakes with sugar paste following the American tradition. Our company offers a large selection of waterfall cake dummies in polystyrene in a variety of sizes. Below you can select the height and sides that best meets your needs. 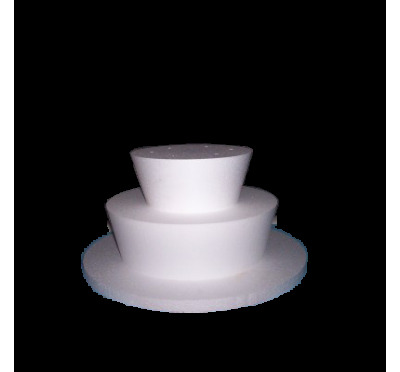 The waterfall cake dummy in polystyrene is a support for flat cakes widely used in the art of cake design and the decoration of monumental cakes for parties. Waterfall cake dummy in polystyrene is essential for a pastry chef. Its particular shape, can provide to cake design lovers with the possibility of using this waterfall form in polystyrene in the way it considers most appropriate according to the occasion. The use of a waterfall cake dummy in polystyrene can have different purposes. It can be used like a support of a waterfall cake, to give a more slender optical effect to the cake. Nevertheless, it can also be used to make flat cakes without the hardship of baking. In fact, covering the sides of the waterfall cake dummy in polystyrene with sugar paste or with fondant paste, and overlapping dummies of different sizes, you can create real sculptures, able to fascinate anyone who observes them. In other cases, waterfall cake dummies can also be a valid substitute as cake trays for Muffins or Cupcakes, for parties or banquets. If you overlap more waterfall cake dummies in polystyrene, you can create a structure around which to place the sweets Waterfall cake dummy in polystyrene are also perfect for cake design courses to allow lovers of the bakery, even beginners, to perfect their sugar craft skills. With a lot of creativity and ability, you can create a great ad example cake. This fake cake is perfect for shop widow or wedding. With the waterfall cake dummy in polystyrene, you can make a surprising royal cake to show your ability at events. Using the waterfall support for flat cake means offering to the pastry chef the opportunity to practice their art without waste. In fact, to create a monumental cake, the pastry chef have to exercise his ability and overlap more decorated level of cake. However, if the number of guests at the party is not too high, a cake of excessive size increases the risk of producing leftovers. To solve this problem and reduce waste, the pastry chefs can use cake dummies like support of the real cake. The result is to provide the observer with the idea of a very big flat cake. The peculiarity of the waterfall support for flat cake in polystyrene is the ease and practicality of its use. It is made of an ecological and non-toxic material; therefore, the polystyrene of the waterfall support for flat cake can also be used for food. Another fundamental feature of polystyrene is its durability over time; therefore, the waterfall support for flat cake in polystyrene tops is not subject to deterioration and can be stored for a long time. For this reason, the waterfall cake dummy is perfect for the windows of bakery and cake design dealers. The waterfall dummy in variety of sizes is of excellent quality. Our company with years of experience in the processing polystyrene and sophisticated hot wire machines for precise and accurate cut offers a wide choice of heights and diameters. Our basic waterfall dummy catalogue, in fact, allows you to choose cake dummies of different sizes, to satisfy every need. You can choose heights of 4 inches, 5 inches, 6 inches and widths of 10 inches, 12 inches, 14 inches, 16 inches, 18 inches and 20 inches. The Deart Polisitrolo guarantees the customer quality and reliability, with fast and safe shipments.